Not a lot of cooking went down this past longweekend. First we moved some stuff into storage space, then had a birthday party on Saturday evening, a braai (barbecue for the non-South Africans) on Sunday with friends and yesterday afternoon my parents surprised us with a visit all the way from Durban on the other side of the country. That was a really cool surprise as we haven't seen them since last December when we visited them over the Christmas holidays. They'll be around for the rest of the week, hence I don't know how much posting I'll be doing. So here's something I made a while ago. I'm quite pleased with how it came out - the flavours blend into a satisfying and very filling dish. 1. Preheat oven to 230°C. Place butternut on a baking tray, sprinkle with a little bit of olive oil, salt and pepper and bake for about 15 - 20 minutes, or until tender. 2. Meanwhile, heat 1 tablespoon of oil in a large saucepan over medium heat. Add onion and garlic. Saute for about 5 - 6 minutes or until onion looks glazed. Add spices and cook for another minute to release the flavours. 3. Add rice and stock to pan. Bring to the boil, then turn heat down low, cover and simmer for about 20 minutes. Add peas, cover and simmer for another 5 minutes or until rice is tender and peas cooked. Lastly add spinach, stir to combine and cover for another minute or two, until spinach is wilted. 4. In a seperate frying pan, heat the remaining oil over medium heat. Season lamb with salt and pepper and cook for a few minutes until done to your liking. 5. 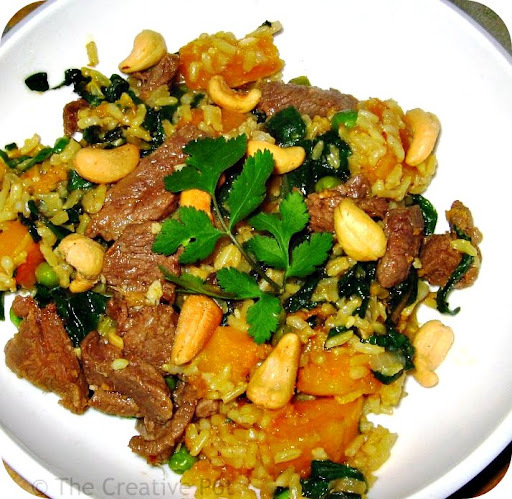 Add lamb, butternut and nuts to rice mixture. Stir and taste, adjusting seasoning if necessary. Serve warm, sprinkled with fresh coriander sprigs.